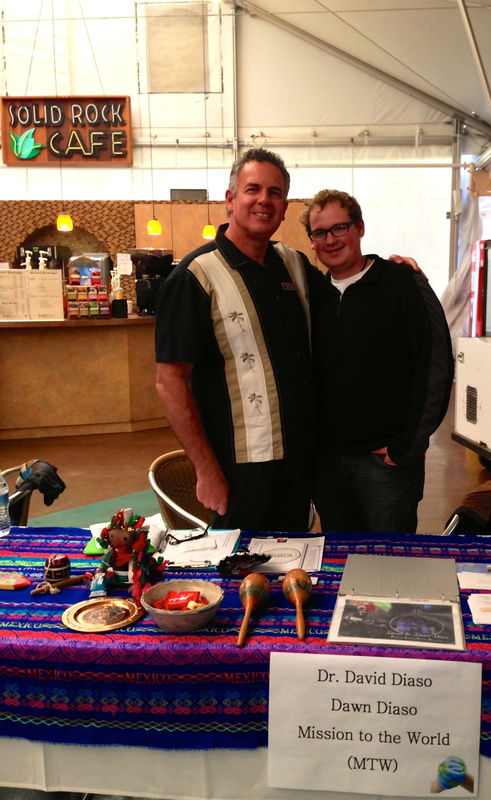 Dawn and I had the privilege of participating in San Diego Christian College’s (SDCC) International Outreach Festival. We enjoyed interacting with the students and meeting with some of the other missionaries. The thing that we enjoyed the most is that our son, David Jr. attends the school. It was fun being with David and his friends. The Lord has blessed David at the school. Some of David’s teachers came up to us and told us that they think very highly of him. They told us, “your son is a leader and an impact student.” Since Jon and Hannah just left it makes it extra special that we could spend time with David today. Thank you, Lord for comforting us! We took the opportunity while at the school to encourage and motivate students to get involved in missions on the border. One of the ways we could use their help is to go out into the community of City Heights to promote our ESL class. Another opportunity we are exploring is for students be involved in outreach with our church plants south of the border. We pray that the Lord will raise up all kinds of different workers to serve with us. Great post: passing on the generational baton. Thanks – I do pray the Lord will raise up many to serve him and go out into the world in the upcoming generation! Amen! David Jr. has a great example! Missionaries are very special people, having received a direct message and mission from God. I pray God will build a hedge, that Satan can’t penetrate, around your family as you work. Thank you – we’ve found that we do need to put on the armor of God each day and pray looking to him to protect us in the battle.